Can I see your papers? 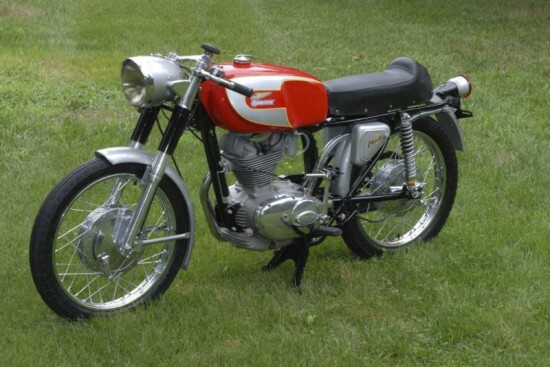 I’ve been fixated in these Single cylinder Ducati lately. When I saw this one with no papers I thought, alright, maybe one that will go for cheap. Not so. These machines are so clean, so simple yet such amazing sport bikes. 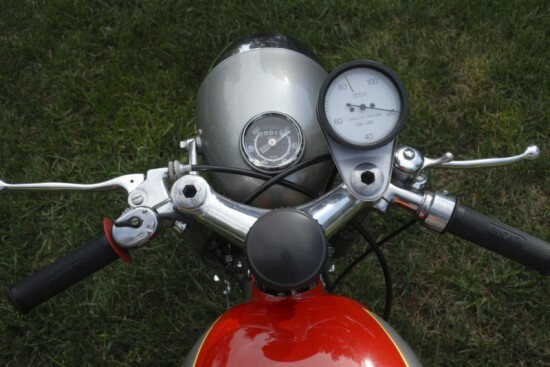 One of the things that make me so interested in classic sport bikes is how simple they look. This bike falls into that perfectly. Ducati really new how to make a work of art that you could blast through the back roads on. That’s part of the reason I suppose they fetch such a high price and people always have pictures of them in their living rooms. No exception here. The seller has one pic that shows two of these awesome bikes in his house. Here’s what he has to say about the bike. Restored to a very nice condition with a lot of new parts. A wonderful looking Ducati that has been a “bookend” with a few of my other Ducati singles on display in my basement. 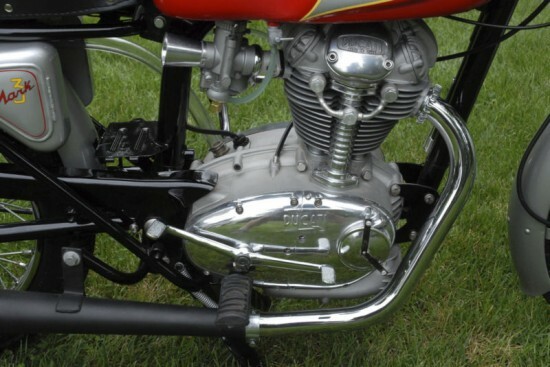 This bike is not restored to 100% original condition but it is very close. I have only run the bike during the past two weeks to make sure everything works. I have put a fun 22 miles on it and it is loud. The bike runs very well with a Mikuni carb that I use when I ride my singles. The “correct” Dellorto SSI 29D carb will be on the bike for the new owner. I recommend the new owner buy a Mikuni or new Dellorto pumper if it will be ridden as I will be keeping this Mikuni. The Mikuni works very well with the “Grey Cam” that is installed and it has screw adjustable rockers for easy value adjustments. A black knob on the Hi/Lo switch is missing and the steering dampening knob has some chips out of the edges. These bikes have AC ignition and lights, no battery, no key and the unique N/E switch on the taillight bracket. The reason for selling this beauty, as most of you will understand, to invest in another Ducati of course. Just when you think this is one of the coolest bikes I have, something more unique comes along. This M3 has no paper work, no title or registration. I will supply a “Bill Of Sale” if you like. I have added a lot of pictures, some photos were taken before the Tach drive, tach and chain were put on. Pictures with both carbs on the bike are also shown. Thank you for checking out this beautiful Ducati. We are an interesting group and it is a lot of fun, great people and cool machines. Next story We build airplanes, and motorcycles for Harley Davidson.